An oil filter which improves oil pressure drop and flow properties by approximately 30% compared to current aftermarket sports oil filters. Most aftermarket sports oil filters to use high viscosity oil and therefore filter paper strength is prioritized whilst sacrificing absolute pressure loss properties. HKS Hybrid Sports Oil Filter has readdressed filter strength and overall structure to provide the oil flow that the engine requires and pursue HKS’ ideals in what is required from a sports oil filter. 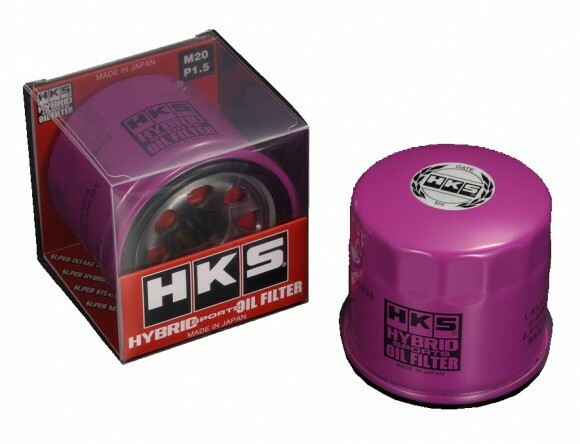 HKS Hybrid Sports Oil Filter has readdressed filter strength and overall structure to provide the oil flow that the engine requires and to pursue the HKS ideals in what is required from a sports oil filter. New HKS oil filter improves oil pressure drop and flow properties by approximately 30% compared to standard oil filters. Newly developed low resistance hybrid filter allows for low pressure loss. Engine response is improved by reducing the load on the engine. In the interest of universal fitment, unit size has been standardized at φ68×65mm. Fitment bolt sizes are M20-1.5P and 3/4-16 UNF. Filtration performance JIS standard is 25μ whereas HKS is 20μ making the Filter compatible with most standard engine requirements. Under normal usage, it is recommended that the filter is changed every 6,000 miles or 6 months. For Sports driving, the recommended distance is approximately 1/3 -1/2 of the previously mentioned figure (as the engine revolutions are several times that of normal driving). However, to maintain optimum low pressure loss properties, it is recommended to change the filter every 3000 miles when an oil change is performed. HKS Hybrid Oil Filter’s low pressure loss properties mean that even standard specification engines can benefit from reduced engine resistance and improved engine response.